I’m queen! Yippee! But now doubt has set in … So many kings and queens have had terrible personal lives. All that power would be very bad for your mental health. No popping corks, I’ll have tea please. It’s what I had immediately after getting married [to architect Mark Hines]. I said, ‘no champagne, thanks, give me a cup of Earl Grey’. Then I’d share the news with my mum, Enid. She would be pleased but would instantly want to know why she hadn’t been made queen first. Moving countries as a child had a lasting impact on me. 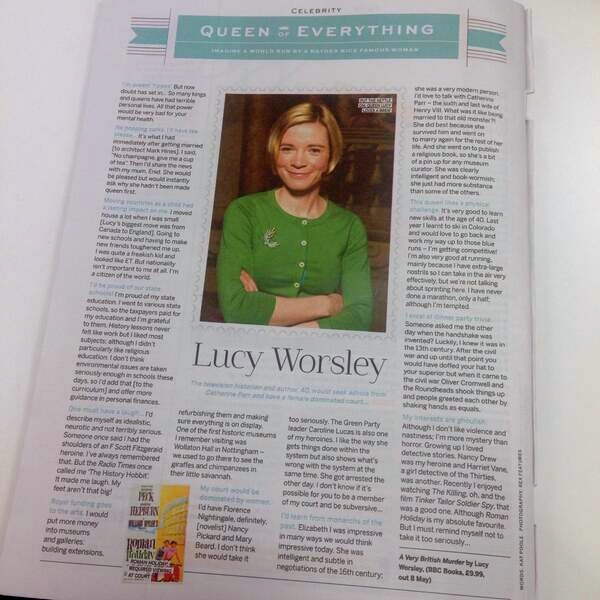 I moved house quite a lot when I was small [Lucy’s biggest move was from Canada to England]. Going to new schools and having to make new friends toughened me up. I was quite a freakish kid and looked like ET. But nationality isn’t important to me, I’m a citizen of the world. I’d be proud of our state schools! I’m proud of my state education. I went to various state schools, so the taxpayers paid for my education and I’m grateful to them. History lessons never felt like work but I liked most subjects. I don’t think environmental issues are taken seriously enough in schools these days, so I’d add that [to the curriculum] and offer more guidance in personal finances. One must have a laugh… Someone once said I have the shoulders of an F. Scott Fitzgerald heroine, that’s a compliment I have treasured. But the Radio Times once called me ‘The History Hobbit’. It made me laugh. My feet aren’t that big! Royal funding goes to the arts. I would put more money into museums and galleries, building extensions, refurbishing them and making sure everything is on display. One of the first museums I remember visiting was Wollaton Hall in Nottingham – we used to go there to see the giraffe in the hall and the chimpanzee in his little savannah under the stairs. I’d learn from the monarchs of the past. Elizabeth I was impressive in many ways. She was intelligent and subtle in negotiating sixteenth century life, she seems like a very modern person. I’ve love to talk with Catherine Parr – the sixth and last wife of Henry VIII. What was it like being married to that old monster? She did best because she survived him and went on the marry again to the love of her life. And also published a book, so she’s a bit of a pin-up. She was clearly intelligent and book-wormish and had more substance than some of the other wives. This queen likes a physical challenge. It’s very good to learn new skills at the age of 40. Last year I learnt to ski in Colorado. I’m also very good at running because I have extra-large nostrils that means I can take the air in very efficiently. But we’re not talking about sprinting here. I like 10k or a half-marathon. I excel at trivia. Someone asked me the other day when the handshake was invented, and luckily I knew. It was in the sixteenth century. Up until the Civil War, you would have doffed your hat to your superior. But when the Civil War came along to shake up the old order, Oliver Cromwell and his Roundheads greeted each other by shaking hands as equals. 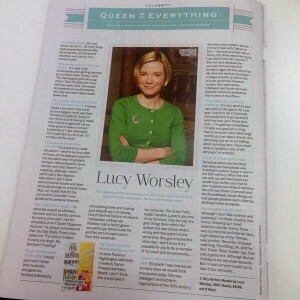 A Very British Murder by Lucy Worsley, BBC Books, £9.99, out now in paperback. Intrigued by your inclusion of Florence Nightingale. Who, whilst no doubt sincere in her intentions, did possibly more harm than good owing to her lack of understanding of cross infection. Whereas I believe, it it is now acknowledged that, a more effective contribution was made by, the until recently less publicised, work of Mary Seacole.